We now bring you a select fleet of charter yachts offering a variety of ‘Health and Wellbeing’ holidays afloat. Combine your love of the ocean with your need to discover and immerse yourself in a ‘healing’ environment that works along the lines of some of your favourite Wellness techniques. Taking a holistic approach to our bodies and minds and working with nutrition, exercise and spa therapy, the environment provided by a privately chartered yacht is ideal for a health retreat as it encapsulates the elements we seek. We have various programmes already set out but are also very happy to work with your ideas to create a totally tailored week including your own favourite therapists or drawing from our recommended health and wellbeing professionals to work with you towards your own goals. Miraculous food, perfectly suited to YOU – combined with a complimentary daily routine is the key to a healthy body. Yachts specializing in health retreat charters have chefs who understand and create diets to perfectly suited to your needs and who will work with the other members of staff to put together your bespoke health programme. Sourcing and using the best of local organic produce alongside other vital ingredients while listening carefully to your requirements and aims, the menus will be written with your goals in mind. Whether you want to cleanse your body or to lose weight; maybe you seek nutritional therapy for a specific health problem or allergy; or possibly you want to build strength and fitness, we will find you the yacht and chef that offer the perfect healthy holiday package. Alkaline diets and raw diets, deliciously tasty weight loss diets and macrobiotic diets are just a few possibilities. To be aboard a boat floating on the sea is to be on a polar axis of the eternity between the top of the sky and the depths of the ocean. You have already removed the distractions of the land and civilization and moved towards a purer, simpler existence. Now bring into it a meditation guru, lifestyle expert or mind coach practitioner (such as Neuro Linguistic Programming or Cognitive Behavioural Therapist) and you have the ideal environment to create a truly life enhancing experience. Once again, let us know if you have your own ‘mind guide’ that you’d like to have on board with you or whether you’d like to consider our own teams. Yoga, Pilates or a fitness regime with a personal trainer. All great ways to get your body in shape and return home feeling revitalized, relaxed and ready to ‘face the world’ again. A yoga retreat on a yacht is idyllic. In the Mediterranean we usually work these in May, June, September and October when tourism is at a lull, the coastline is peaceful, the weather is warm and waters calm. Turkey is one perfect spot for this. Imbued by magical morning light and eastern mystery, it is a natural home for those seeking a little respite for the soul. A deep cleansing hammam treatment to start the retreat leaves your body ready and receptive for the rest of your stay on board while deliciously healthy menus compliment the holistic approach to a balanced lifestyle. A huge percentage of the charter fleet now boast exercise equipment on board ranging from simple exercise bikes to fully equipped gymnasiums – personal trainers optional. Many of the yachts have realized that our guests seek to return home looking and feeling better than when they left. Yachts of all sizes have their own masseurs and therapists on board and many of the Super Yachts offer complete spa facilities including saunas, steam rooms, light treatment rooms, beauty therapists, hairdressers and more. We will bring on specific therapists at your request or you may wish to invite your own favourites. 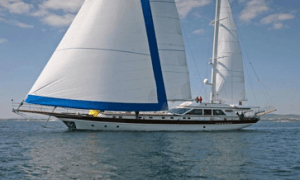 Please take a quick look through our list of Recommended Yachts below for ideas but remember we are adding new ‘healthy holiday yachts’ to the fleet all the time. Let us send you a more comprehensive list with further details of the suggested yachts.